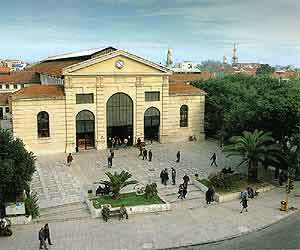 One of the landmarks of Chania is the "Agora". 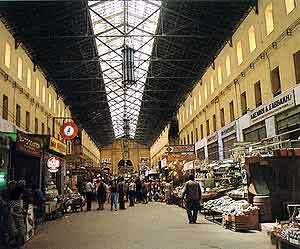 The cross-shaped covered market at the centre of town was built in 1911-1913 after the model of the market of Marseilles and is unique in Greece. A busy market selling fresh fish, meat and produce, it also houses several tiny restaurants cooking simple but tasty food. Definitely worth a try. In the summer it is often a little too crowded with tourists and is best visited early in the morning. There are a few weekly street markets in the towns. The most popular one is on Saturday in Chania in Odos Minoos, near the eastern fortification wall. The market offers mainly local fruit and vegetables, some fish stalls, live chicken and rabbits, a couple of plant stalls and cheap clothes stalls. It is a great place to buy fresh produce at low prices but even if you don't buy it will give you a glimpse of local life.